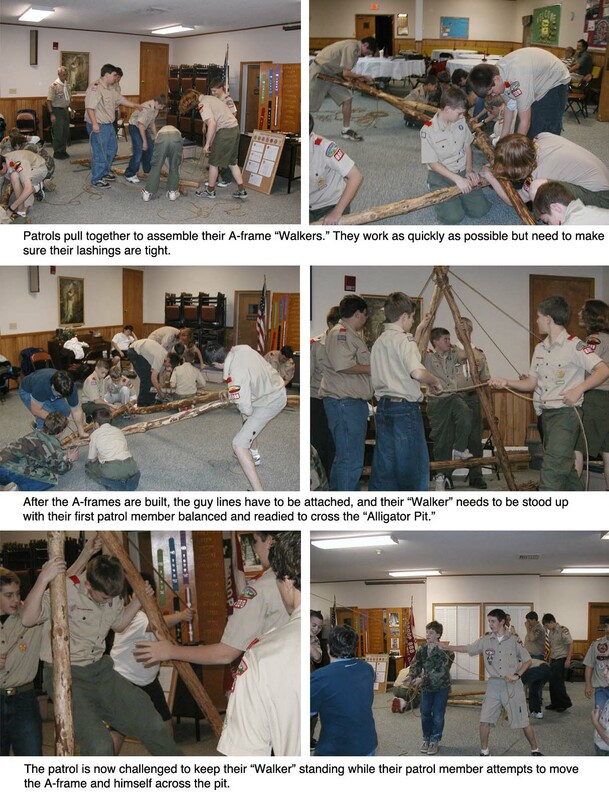 The real challenge built into this activity comes into play after the lashing is finished. The patrol is simply building a very well-lashed A-frame. As with all pioneering endeavors, teamwork is essential. With this interpatrol challenge, it’s absolutely necessary! Cossing the Alligator Pit affords a superlative team building opportunity. Read about and view one patrol’s very impressive accomplishment! Method: The “Alligator Pits” are marked on the ground, one for each patrol, 15′ x 15′ square. Patrols line up on one side of their pits. On signal the patrols lash together an A-Frame “walker” using either three square lashings or two square lashings with a shear lashing at the top. At the top they attach two 20-foot lashing ropes, and attach two more ropes at each corner of the crossbar, using roundturns with two half hitches. These are the guylines. The patrol then stands the “walker” upright, and one member climbs on the crossbar. One Scout mans each guyline to help steady and to help propel the Scout on the crossbar as he tries to “walk” the A-Frame across the pit. Only the A-frame “walker” is allowed inside the pit. Note: This activity should only be held indoors if the floor is carpeted. Generally, tile or wood floors will be too slippery and hence minimize the likelihood of success. Reblogged this on Tarjcooper's Blog.